SANTA BARBARA, California (CNN) -- A wind-fanned wildfire spread across 1,300 acres in Santa Barbara County, California, early Thursday, forcing 13,500 residents to evacuate and destroying at least 20 homes. A wildfire in Santa Barbara County, California, is burning high-end homes in the area. 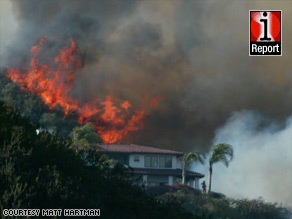 The fire, strengthened by high temperatures and low humidity, engulfed mansions in the coastal community's foothills. "It's just horrible. We're all in a panic here. It's terrifying," iReporter Exton Quinn said Thursday. Her house, on the edge of the mandatory evacuation zone, hadn't burned, she said, but the artist and architect said she was concerned as she headed for Los Angeles on Thursday morning. About 5,400 homes have been evacuated and another 3,500 are threatened, California Governor Arnold Schwarzenegger said at a news conference. iReport.com: Are wildfires affecting you? "Firefighters, thank you, thank you, thank you for your hard work," he said. A day earlier, fire officials expressed how difficult it is to fight the blaze. The blaze, which started Tuesday, came six months after the Tea Fire destroyed about 200 homes in the Santa Barbara area. Though there was no official count on homes destroyed early Thursday, one firefighter said he saw 20 homes scorched. Firefighting helicopters and aircraft as well as 177 engines were being used. "I'm looking out towards the east, and it's just a big cloud going from the coast all the way to the Channel Islands," he said of smoke from the fire. "The sun is just rising, but it looks a little bit like sunset because the cloud is covering the sun," he said. Wildfires also were burning in Arizona near the Mexican border. One blaze covered about 4,000 acres near the city of Sierra Vista. It had destroyed three homes and sent an area resident to the hospital with third-degree burns, according to the National Forest Service. Three other smaller fires in the area were largely or completely contained, fire officials said. CNN's Jim Kavanagh and Kara Finnstrom contributed to this report.